We’d love your help. Let us know what’s wrong with this preview of 100 Things to Do With Kids Inside by Chrystal Boyl. Stuck inside with kids who are driving you crazy? 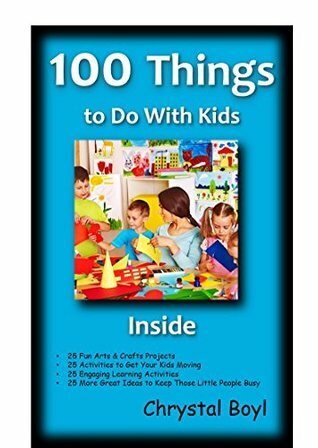 Find 100 fantastic indoor activities to do with your kids in this easy-to-use book. Each activity includes a list of all the supplies that you will need, as well as step-by-step directions to make putting these ideas to use with your kids as simple as possible. 25 Activi Stuck inside with kids who are driving you crazy? Find 100 fantastic indoor activities to do with your kids in this easy-to-use book. To ask other readers questions about 100 Things to Do With Kids Inside, please sign up. I mean... This was fine. There are times when a mom is frazzled and her brain just doesn't work and in that regard, having a book with a bunch of simple activities to distract her kids would be really helpful. But hide-and-seek and making origami is hardly revolutionary. I got this for free (or 99 cents) in a promotion - I would have been really disappointed if I paid full price, but I'm not sad about having it in my library.